US demand for active and intelligent packaging is forecast to grow 7.3 percent annually to $4.0 billion in 2019. Intelligent packaging such as time-temperature monitors and smartphone-enabled interactive labels and tags will be the fastest growing segment, increasing at a double-digit annual rate. 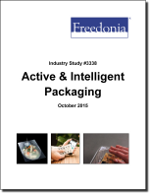 This study analyzes the $2.8 billion US active and intelligent packaging industry. It presents historical demand data (2004, 2009 and 2014) and forecasts (2019 and 2024) by product (e.g., gas scavengers, corrosion control packaging, moisture control packaging, susceptor packaging, color indicating packaging, time-temperature indicators, QR codes, NFC components) and market (e.g., food, beverages, pharmaceuticals, primary metals, motor vehicles, electronics). The study also considers market environment factors, details industry structure, evaluates company market share, and profiles 48 industry players, including Rocky Mountain Metal Container, Reynolds Group, and Plastipak Holdings.